At Lovereading we are passionate about providing help and guidance so you are able to choose the books you want to read at the best prices. As a registered member you will recieve regular emails full of hand-picked recommendations in the book categories you have told us you want to be kept upto date with. And you can change these at any time by logging into your account. Some of you might be familiar with and have used some of our unique features and tools others are perhaps less so. For example, did you know there are over 15,000 Opening Extracts on Lovereading, all waiting for you to discover, download (for free) and enjoy. iPads, KOBOs, Nooks and Sony eReaders – not to mention all the millions of Smartphones and tablets – no wonder eBook sales have skyrocketed. But where to go to get the biggest choice of eBooks in one place? ‘Simples’ it’s Lovereading, where you’ll find expert guidance and ‘one click’ links to all the popular formats, making your life as a digital reader a doddle. We are here to help you choose your next great read. 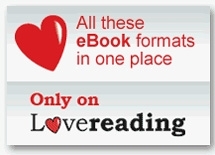 Use our guidance including reviews by our editorial experts and from our Lovereading Reader Review Panel, along with thousands of free Opening Extracts, then the eBook format you need is just a click away. All the eBook formats appear in our ‘other formats’ box that is on every book page. Owners of iPads and KOBOs can click direct to the iBookstore or KOBO store (we are exactly the same price) and Nook and Sony eReaders can download the ePub format which will work on those devices. For days you’re wrapped up in an amazing story; then suddenly it’s over. When you’ve finished a great book, Lovereading‘s Like-for-Like tool helps you find another to fill the empty feeling. Sarah Broadhurst has reviewed 2,500+ top authors and used her encyclopaedic knowledge to recommend other authors similar in style. Just type in a name and explore some new literary avenues. A truly great book is priceless. But assuming you don’t have that much to spend, find the best deal here. Introduced by popular demand, our Book Price Comparison Engine searches dozens of online retailers and displays prices and postage costs for any book. Often Lovereading‘s flat rate 25% off may be cheapest; sometimes you’ll buy cheaper elsewhere. Either way, you’ll be glad you checked! It’s easy to use just click the button next to the book you are interested in – that’s it! Make sure you connect with us online to keep up to date with latest news, offers, share your thoughts and discuss your favourite reads – and the chance to grab some prizes in our regular competitions! Follow us on Twitter (@lovereadinguk) , and join our genre-specific Facebook pages as you please… or join them all and never miss out on any of it! Even if you read non-stop it’s tough keeping up with the dozens of great books published every month. Our Wishlist feature lets you keep an electronic note-to-self of books that catch your eye. So if you don’t want to buy it now, at least you won’t let some life-changing literature slip by. You can also email your list to friends and family, so they’ll know exactly what you want for Christmas or Birthdays! To enter books on your Wishlist – just click the button by the book. And all the books in your Wishlist can be moved to your shopping basket at the click of a button.